Hey Hankheads! I need your help. 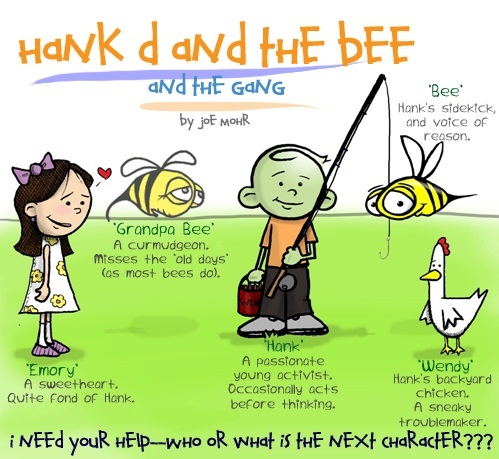 Can you suggest a new character for Hank D and the Bee? It can be an animal, a person, an insect, or anything your creative little brains come up with! Just leave your suggestions in the comment section of this cartoon, or (if you’re reading this on NaturalPapa, EcoChildsPlay, or EcoSnobberySucks) on my cartoon archive website. After a week or two, I’ll put my favorite suggestions to a vote. I feel we need a mother earth representative. I would like to see a character named “Daisy” that comes in for repeating thoughts and commentary’s from the earth. A flower that can show us the beauty of Hank’s pursuits. Or maybe a Black Eyed Susan that keeps getting beat up from all the environmental issues. Don’t comment on my misspellings. Stupid auto correct. Hey! Hank has Emory. Bee needs a ‘Hunny’. ← Finally, the Pro-life/Anti-earth Oxymoron Explained.